I would like to thank the following who have contributed their expert knowledge to the website and those who have supplied photographs from their collections or simply advice and inspiration. A special thanks to my researcher and French translator Anne Elizabeth. And also my local library staff, Christina, Beth and Shirley who have over, several years tracked down some very obscure books for me. Previously William Gilkerson was the only scholar to have made a study of Boarding Axes from several nations, it being a chapter in ‘Boarders Away’, a book that covers naval weapons from the age of fighting sail (1626 - 1826). This work remains a valuable reference even now, twenty five years later. I acknowledge its contribution as part of the foundation for this study and in some ways the inspiration for it. For the sake of completeness I have covered the same material as Gilkerson, with some updating due to more available information. I have expanded the timeframe to include regulation patterns adopted by governments later than 1826 and also widened the scope to include more countries. I have also included a section on private purchase axes which are perhaps the most difficult to identify. The page on NOT Boarding Axes will, I hope, provide some protection to collectors from the mis-selling of axes that are incorrectly identified. Since the publication of ‘Boarders Away’ there have been other scholars who have covered the subject for particular nations as part of wider studies on marine weapons, for example Kurt Bang Peterson’s excellent “Danske Marineblankevåben”, and I have used these where I could find them. Museums and their curators have been very helpful and I have especially made use of online digital collections wherever possible. Expert knowledge is hard to find and for some nations information is very scarce. I hope that some gaps may be filled in by drawing on the resource of collectors and experts viewing this site. I am aware of the dangers of drawing conclusions from a small number of examples but unfortunately with boarding axes, that is often all there is. Measurements with a small sample size can also be suspect especially if there has been damage - a broken off spike, for example, repaired to a point may not be discernable. Translations can also be a source of error and although I have tried to verify any uncertainties there is always some scope for inaccuracies. To the best of my knowledge the information is accurate but due to the limitations as stated above this may not always be the case. I have attempted to attribute all photographs used, but it has not always been possible to track down the source from online content. Again, I hope that submissions of better photographs from collectors will add to the value of the site. Corrections, additional information, photographs and the submission of boarding for axes for inclusion, especially those for the private purchase section will be considered. All articles, descriptions and photographs, where not otherwise attributed, are the copyright of Seaxe and must not be reproduced without permission. Copyright © 2015 Seaxe @boardingaxe.com · All Rights Reserved. The National Maritime Museum, The Navy Museum, and the Army Museum, Sweden. 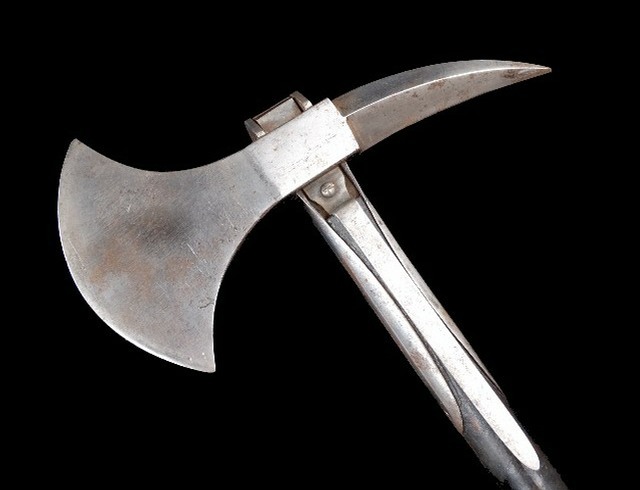 +1786 Model French Axe, Improved Spanish Information, + Scandinavian private purchase axe, + Manufacturer British axes - Edwards. Spell correction Bates to Yates. Add photo Gilpin mark. Latest date to 1899. Add Maberly, Whyll to makers. Spell correction Brookes to Brooks. Add photo of Brooks maker name. Major revision to British page. Thanks to all those who have already contributed to the site and sent in pictures from their own collections. sea.axes @gmail.com or click on the button.